I admit that I like to tinker in the shop. And, I admit to taking a certain satisfaction in slicing up innocent inanimate objects with restrained reckless abandon in the backyard on occasion. Anyway, I thought I would share a few of my tinkering around projects, some of which are failures, and some of which seem to somehow miraculously come together to produce a very functional sword. This is my ColdTrim. I bought a bare ATrim blade (not sure of the number) from Lee Reeves as part of Lee's inventory liquidation which was in need of a hilt. After much staring at the blade in an attempt to get it to say something to me one day a straw basket fell off of a high shelf in the garage and like the proverbial apple - aha - inspiration struck the blank canvas of my mind again (just kidding,... or.... maybe I am not). So one thing led to another and I wound up buying a Cold Steel Basket hilt sword and decided to mate that basket (also known as the frankenschiavona) with the ATrim blade. 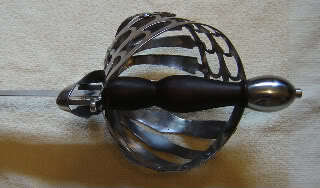 This required a number of various modifications which deeply satisfied the tinkering around the workshop factor, namely, the shoulders of the blade had to be filed flat and square, the opening on the basket had to be hand filed to just pass over the tang (Gus' blade has a beefier tang than the CS). Finally, the pommel had to be drilled to accept the typical Atrim nut (the outer diameter on the nut being 3/8ths) and drilled to accept the larger tang so that the shoulders of the tang would fit squarely on the inside of the pommel and the nut would do the same, just like Gus does with his stuff. Then I decided to color outside of the lines. I went to a friends house with some walnut and began turning a handle on his lathe. The intent was to experiment with the handle based on things I have noticed over the years of handling sharp pointy steel objects. After three complete screwups the fourth attempt seem to get where I wanted to go. Namely, for me when it comes to handles there is this sweet spot between rectangular and oval in shape, but more towards the rectangular side is my preference. I just like that better. So after turning on the lathe there was a bit of belt sander time. I also like how late victorian swords have a depression on the "top side" for placing the thumb which can aid in point control which of course is used on almost all modern fencing foils. Finally, I carved a deep circular recess for the index or middle finger to hug. I call this a "finger well" and is designed so that the main grip occurs with the thumb and the first two fingers. Realize - this is an experiment - next year I may change it out completely but for now I am quite happy with it. The final specs are 32.5 inch blade, 1 5/8ths at the hilt. 1/4 inch stock. 24 inch long single fuller. blade tapers only a little down to the 24 inch area at the end of the fuller then has a steeper taper out to that last inch and the pointed tip. The overall sword is 39.25 inches long. has a POB 4.25 inches down the blade and a COP right about 24 inches where the fuller ends. It weighs 1390 g. So as you can see, this is a "beefy" blade of Gus', with a simple cross hilt the POB on this probably would have been about 5.5 inches down the blade. With the basket that brings it back a little, yet this is no light weight - it hits with a pop. So far I have noticed no undue vibrations at the secondary node under the hilt. Sharpened, it cuts really really well. In the first photo I show it in relation to my A&A Cavalier which interestingly, also weighs 1400g. Different blade section and profile, but similar size and weight and POB. Clearly the Cavalier has better point control but the ColdTrim has the edge when it comes to cutting. Just so this isn't another post into a black wormhole of no replies, please understand all feedback good or bad is welcome. Even "what a POS" . I admit the CS schiavona basket is a little strange, it has rivets in place of welds, and the overall shape is too much of a globe, and the pommel doesn't fit with a schiavona. However...... I have to say that the basket exceeds my expectations in terms of its strength, fit, and finish - almost all of the welds are really nicely done, nicer than some of the custom work I have seen. It is just that the basket has these strange non-historical quirks. But for a practice sword that is ok in my book. Interesting grip shape. Pretty nice pic a swell, a good illustration of the importance of keeping all three dimensions in mind. And I'd say that the basket seems a bit more at home used in such an "unhistorical" project. Looks good! I realy like the grip. Yes that grip shape seems interesting and the whole thing looks good to me. Whatever isn't historical or perfect design like maybe the basket being too spherical I still like it. ( Just to avoid that " Black Hole of No Replies " ).